Lord Norman Foster-designed 63-story tower at 610 Lexington would use air rights from Seagram Plaza. Image: Foster + Partners. Transfer of air rights from landmarked Seagram Building facilitates construction. 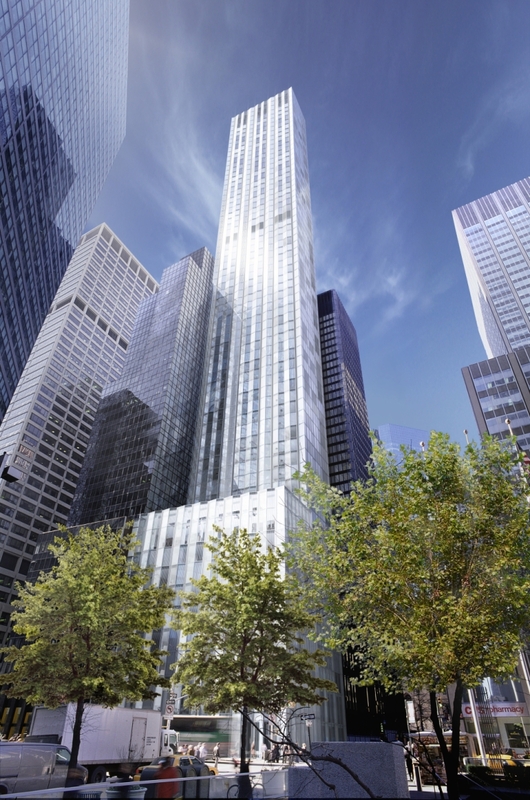 On July 2, 2008, the City Planning Commission approved the special permit and zoning text amendment proposed by developer Aby Rosen, allowing his 63-story project at 610 Lexington to proceed to City Council for a vote. The proposed mixed-use building on the southwest corner of 53rd Street and Lexington Avenue would stand approximately 712 feet tall, with 282,027 sq.ft. of floor area, including a restaurant, bar, and hotel uses on the first through 52nd floors and residential use on the top ten stories. Rosen requested a special permit to transfer 200,965 sq.ft. of unused floor area from the landmarked Seagram Building, a building owned by Rosen, leaving 212 sq.ft. of unused floor area on the Seagram lot. This transfer required Landmarks’ approval of a preservation plan for the Seagram Building, which Rosen obtained in 2007. The Lord Norman Foster designed building would consist of a nine-story podium fronting Lexington Avenue and a 63-story tower set back 56 feet from Lexington Avenue and separated from the Seagram Building by less than 150 feet. In addition to the air rights transfer, Rosen requested a text change to the Special Midtown District to allow additional modifications for height and setback, inner court regulations, minimum distance between required windows and lot lines, accessory off-street loading berths, and pedestrian circulation space. The Planning Commission approved the applications without modification despite concerns of Community Board 5 and Borough President Scott Stringer that the project lacked an off-street loading berth and set a potentially dangerous precedent by allowing a text change to the Special Midtown District for one building. In its approval, the Commission found that the lack of an off-street loading berth would not significantly add vehicular congestion due to the small amount of event space within the hotel. It stressed that further development of the Seagram Plaza was unlikely given that only 212 sq.ft. of unused floor area remained. The Commission noted that any disadvantages associated with the approval would be more than offset by the developer’s maintenance plan for the Seagram Building.